Heys If you have some time could you check out these questions and note me the reply, or post it in the comments ^^ it would be really helpful for both school and for the intro of TtR aha o.o Thank you! Do you like program intro's? Do you think the image or the music is more important? What would you want to be in the intro? Scenes from the show? Hypothetical re-enactment between characters ect. 10sec/ 30 sec/ 45 sec/ 1 min/ longer? DA has given me a chance to find new artists and meet them in person. To discover new styles and techniques, that are often inspiration for my own work and push me to try new things. Though if you'd like to help me share it I would appreciate it majorly! So if anyone is willing to make journals or post it on your blog/tumblr/twitter anything like that, then I would love you forever!!! And hec if you want I can give you a couple points and llama in return? I don't know >.> Bribing probably isn't going to work here is it.... Ah man but please if you could check out the link I would really really appreciate it! I made an animation.... It's my first attempt and I'm only 16 so it's okay... right? XD I had a 2weeks to make and show my media teacher an animation so i could do it for media project and so i made this animation. elevator: ,D1. When there's only one other person in the elevator, tap them on the shoulder and then pretend it wasn't you. 2. Ask if you can push the button for other people, but intentionally push the wrong ones. 3. Hold the doors open and say you're waiting for a friend. After a while let the doors close and say, "Hi Greg. How's your day been?" 4. Drop a pen and wait until someone goes to pick it up and then scream, "That's mine!" 5. Bring a camera and take pictures of everyone in the elevator. 6. Move your desk into the elevator and whenever anyone gets on ask if they have an appointment. 7. Randomly ask "Did you feel that?" When they look at you curiously, begin to explain your theory that a giant has made its way into the building, become more panicked by the minute. 8. When the doors close, announce to the others in a voice of forced calm, "It's okay, don't panic, they open again!" 9. Call out, "Group hug!" and then enforce it. "YAY!~ I get to kill things!" "owowowowow! Timmy she's attacking us with banshee powers!" "Yay! I'm dirty~ I wanna be more dirty hurry n'do the change thingy!" "To clear up any confusion let me explain. 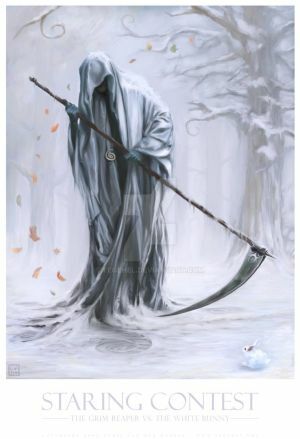 I am Timmy, i may look like a small 7-year old but i'm way way older than that since i'm a reaper, or death incarnate,whatever.Now you have been named and so i have to kill you.Since i'm a reaper, simple really you understand?" Narrator: Average pitch, sounds slightly insane but more of a comical, funny effect. Devious Journal EntryHeys If you have some time could you check out these questions and note me the reply, or post it in the comments ^^ it would be really helpful for both school and for the intro of TtR aha o.o Thank you!